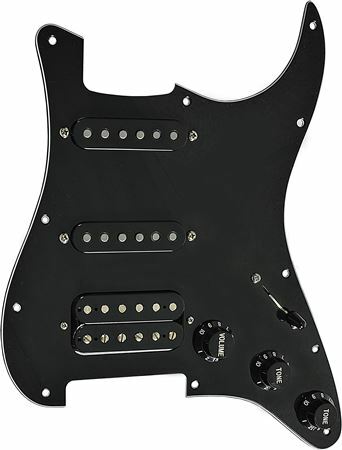 Order your Mojotone '58 Quiet Coil HSS Strat Prewired Pickguard from AMS and enjoy 0% Interest Payment Plans, Free Shipping, Free Extended Warranty & 45 Day Money Back Guarantee. 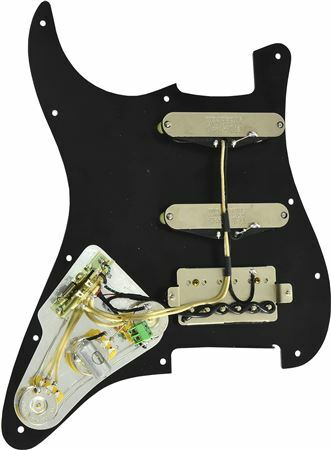 Mojotone HSS pickguards are completely hand-wired to perfection with no soldering required. Each pickguard comes loaded with our most popular noiseless Strat pickups, the '58 Quiet Coils in the neck and middle positions, and our exclusive F-Spaced '58 humbucker in the bridge position. The '58 Quiet Coils offer noise free vintage strat tone without ever compromising true single coil clarity and feel like other hum-cancelling designs. With our custom vintage output '58 humbucker in the bridge position, you get creamy P.A.F. tones that will cut through the mix with authority and unparalleled articulation. Add our unique blender wiring and auto-tapped 2nd position, and you have the most versatile HSS Strat on the planet! Ready to drop in and play with absolutely no soldering required! Blend in your neck or bridge pickup as much as you want in positions 1,2,4, and 5. Our '58 Quiet Coil strat pickups and '58 humbucker eliminate unwanted 60-cycle hum in all 5 positions! Our treble bleed cap allows you to roll your volume control back without ever losing high end clarity and chime. Superior Lead Dressing / Wiring, Excellent Tone! Rarely will you find a loaded pickguard with wiring and lead dressing that is uniform; has adjacent wire runs; uniform soldering as well as the use of top of the line components (CRS pots, Oak/Grigsby Switches, etc.). The pickups themselves are very unique; hum cancelling side by side coils in a single coil space; the "pole pieces" are there for show / asthetics- the actual inductance pieces are completely covered. The pickups have excellent tone; the best "noiseless" single coils I've heard including some of the newer, more innovative offerings. The humbucker in the bridge was powerful yet articulate- hotter than a standard PAF ;not muddy at all. Unfortunately, for me, the neck and neck/middle positions were too bright for my taste; I determined later that the 60s model Quiet Coils and the Rene Martinez offerings are not as bright / tamer in the highs. The installation could not have been easier- no soldering. Plastics are better than Fender OEM! EXCELLENT PRODUCT!